(CBS News) Sometimes I come across videos that astonish me, but I hold off on highlighting until more information is available. This is one of those videos. 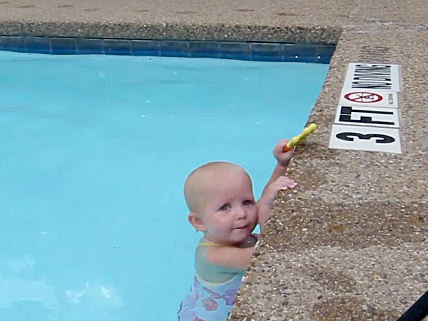 Watch above as an infant demonstrates some very impressive and early swimming skills in the pool learned after lessons. At no point do we force our child to do anything she is unwilling to try. We are able to recognize infant/toddler fatigue in the swimming pool. Elizabeth is a very determined little girl and sometimes she wants to roll over and breath as she was taught and sometimes she wants to hold her breath the whole way. I was 100% prepared to jump in at first sign of distress. Please watch some of the other videos I've posted of her swimming and spread the word. Teach your child how to swim because it only takes a moment for them to slip under and drown. some times the difference between life and death can be six inches of water and their ability to flip over on their back and take a breath. Please! do not just throw your child in the water and expect them to swim. That is both dangerous and a quick way to traumatize your child and scare them from ever swimming. ISR uses specialized techniques in training infants and toddlers.